Vintage Church has a global team headed out. Below you will find a glimpse of the city and a Prayer and Scripture Guide for the trip. This guide will let you walk alongside the team spiritually. Thanks for the prayers. We look forward to sharing when we get back. Vintage Global: Scott & Wendy from Vintage Church on Vimeo. Pray that the team will be strengthened today through his Spirit. Praise God for the church of the city. I am not a completely original thinker. Others' ideas often influence me. Sometimes reading a quote makes me laugh hysterically. Other times a quote will provide me with a romantic text to send Sarah in the middle of a busy day. Then there are some things I read or hear that challenge me as a man, husband or pastor. A Biblical principle of manhood laid out in Scripture is that the spiritual, emotional, physical well being of a man, his wife and children is partly his responsibility. As men our masculinity centers primarily on how good or bad we are leading our wives and children. In fact being a good man who leads, loves and cares might be one of the greatest needs in communities today. In response to this need especially within the city of New Orleans and Vintage Church, the Vintage Church pastors have organized an opportunity for our men to be challenged, developed and grown as men. Pastor Rob’s father, Pastor Don Wilton, will be speaking to us on our priority as Christian, family and community men. 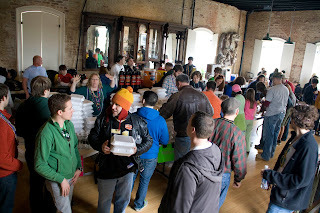 Our Mardi Gras Sunday this year for the Uptown Sunday parades might have been the best so far since we began in 2009. 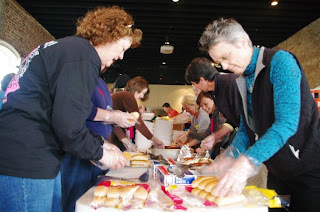 One of our church partners, Temple, brought 100 volunteers to serve alongside Vintage. I'm especially thankful for Pastor Philip Slusher, the mission pastor, for bringing these families who were so excited to serve our city. I also want to especially thank Matt O, Mikey P, Craig, Lenny, Josh and Alex from Vintage Church for their service during the day. We are following up with those who registered this Sunday with letters, emails and phone calls. We ultimately served on Sunday with the hope that God would bring Gospel fruit in individual's lives as a result. Our prayer is that those who came in contact with Vintage Church experienced the difference of Jesus Christ. As a result of our hospitality, service, love and care we pray that people will connect with Vintage Church. Acts 13 tells us that Paul and Barnabas travel to different cities and served people. In one instance, as a result of their love towards others, the Bible says "The next Sabbath almost the whole city gathered to hear the word of the Lord." [Acts 13:44] When I read that I say....Wow! May the Lord work in such a way this week in New Orleans. 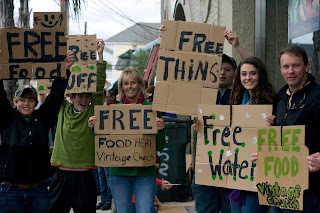 So here's our challenge this Sunday when we gather as Vintage Church in Metairie and Uptown there will not be a small army of volunteers to greet, welcome and connect with the new guests. Uptown averages about 5 new guests per weekend. Instead this weekend will be the time for Vintage Church to BE the church in New Orleans. Carnival Season is one of the most joyous times in the city of New Orleans. Outside of the French Quarter, Mardi Gras is actually a pretty family-friendly event. In the Uptown, Mid-City and Metairie neighborhoods people host dinner parties with neighbors and friends to hang together for the parades. This provides our Vintage Church family with one of the most important times to connect with people outside our church family. This also provides the opportunity to bring the Gospel into the community. So as an Uptown campus family we want to throw a great party this Sunday, February 19th. We will concentrate our efforts on the 3 Sunday parades which pass right in front of the Uptown Arts Center (our Magazine location). We will have one of our church partners help serve alongside our Vintage family on this Sunday. - Send about 250 follow-up letters including information about Vintage Church. I hope you'll join us.....Let's BE the Church! This past weekend Dr. Murray Wilton, known as Pastor Rob's "Uncle Buzz," preached at our Vintage Church gatherings. He discussed the idea of shifting from rational to relational in order to experience the ministry of the Holy Spirit. Heavenly Father, in the name of Jesus by the ministry of the Holy Spirit I believe in my heart that God has raised Jesus from the dead. Jesus you are Lord. Thank you for the authority that I have to live by your resurrection life through the Holy Spirit. Holy Spirit I welcome your presence in my life and invite you to work in me and through me for the Glory of God. In Jesus Name let it be so. He encouraged us to speak this out loud each morning and then journal instances of increased awareness of the Holy Spirit's presence in your week. 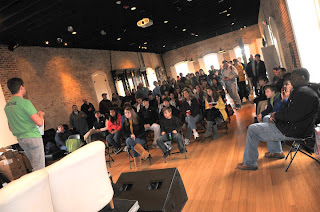 See our Community Group Discussion Guide for further growth. Our American lives seem so packed with work, family, projects and tasks. As we begin to think through New Year's resolutions adding just 2 changes might seem daunting. A 2012 resolution I would encourage every person (Christian or non-Christian) to undertake would be consistent Bible reading. There are plans for beginners that take you through the New Testament, plans with free days to catch up and plans that give you a balanced reading from both Old and New Testaments. For the various options read Pastor Dustin's blog - "Plan your Reading & Read your Plan"
As I was selecting my plan this morning God's Spirit impressed upon my heart that my daily commute provides a prime opportunity. The average American commute is 30 minutes each way. (watch this Community video) Most of us likely spend at least an hour per day in our cars. Let me encourage you to redeem your commute in 2012 through listening to Scripture. The ESV reading plans can be received daily through your email, downloaded as podcasts, printed as a bookmark or input into your calendar. This technology really alleviates every excuse and make this resolution one of the easiest you can make. Remember the goal is to know and love Jesus and His Word more this time next year. Look through the plans, ask God's Spirit for guidance and endurance then begin reading tomorrow.